You probably never thinking that the food you eat will affect dental health. 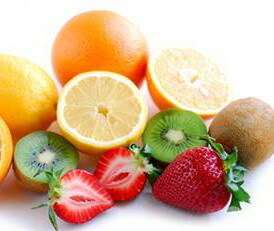 To fight toothache and kill bacteria, some foods have an important role. Research also shows that having a healthy mouth may help prevent heart disease, stroke, preterm labor, and a host of other diseases. Tooth decay is one of the most common dental problems. There is no age limit for this disease. This can occur for many reasons, one of them is a sweet food. Excessive sweetness, making the bacteria growing in the mouth. Blockages leftovers in dental cavities, also triggers cavities disorders. This is the reason why you should brush your teeth every after eat. Every time you eat foods containing sugar or containing starch, the bacteria in dental plaque can form acids and lead to decay. Therefore, choose foods that are naturally able to fight bacteria in the mouth, can remove plaque, strengthen tooth enamel, while providing a fresh breath. That is a great way to maintain healthy teeth and gums. 1. Fruits rich in vitamin C.
Folic acid is needed in large enough quantities to maintain healthy gums and tissues in the mouth whole. Vitamin B can be found in green vegetables and yeast. Isotiosinat compound that found in radish may inhibit the activity of bacteria that cause tooth loss. Black and white sesame highly beneficial to stimulate the growth of teeth. Sesame is rich in minerals calcium, so it can protect the bone around the teeth and gums. Chewing the sesame will provide the cleaning effect of dental plaque and stimulate the formation of tooth enamel. Cheese able to balance the PH in your mouth, where the acidic pH will encourage the growth of bacteria that cause cavities. Eating cheese will also reshape the tooth enamel and produces saliva (saliva) that is able to kill the bacteria that cause tooth loss and pain in the gums. Composition of cheese that low carbohydrate and high in calcium, phosphorus content is also capable of controlling the growth of bacteria that cause tooth loss. Although many people who are uncomfortable with the bad breath caused by consuming onions, raw onion apparently, can be crippling and deadly oral bacteria, because it contains sulfur. Not only onions, garlic was also able to healthy teeth and gums. Garlic contains certain substances that can relieve aches and pains in the teeth. Celery is good when eaten raw because of the production of more saliva while chewing celery could paralyze the bacteria Streptococcus mutants, the causes of brittle teeth (cavities). High in fiber has the effect of massaging gums, and clean up leftover food in between the teeth. And the fresh aroma celery able to bring the freshness of your mouth. In green tea contains a substance called catechins that kill bacteria in the mouth convert sugar into plaque. Catechins are the anti-inflammatories and antibiotics. This substance can also eliminate the bacteria that cause bad breath. Chewing parsley or mint leaves after eating spicy foods will help to maintain the freshness of the scent of your breath. This plant contains monoterpenes, substances that evaporate easily and quickly flow from the bloodstream to the lungs, so it will release the good aroma through the breath. Research shows that the sugar found in shiitake mushrooms, could prevent oral bacteria that creates dental plaque.